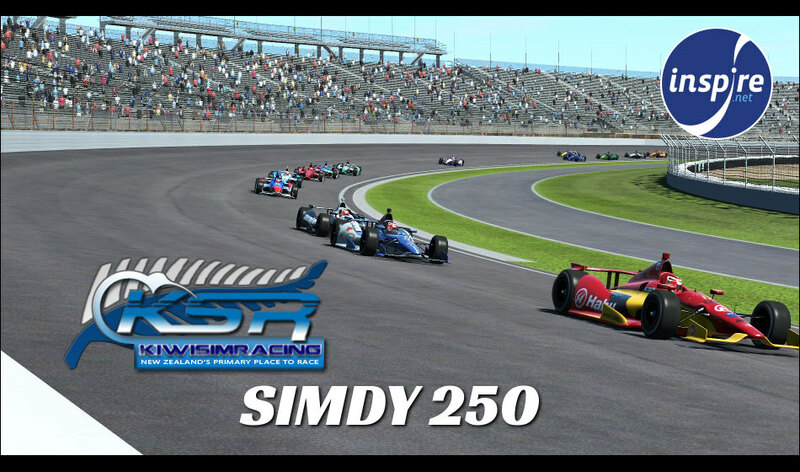 It's the month of May which for some means winter is coming, but for race fans it means the Indianapolis 500 and its time for the 2018 Edition of The KSR Simdy 250. All drivers are requested to be online at least 30 mins but I recommend at least 1 hour before race start to get as much drafting practice as possible and also to get used to the aero understeer. Flag Rules - Full with manual Full course cautions. Full course cautions will only be activated if its a multi car crash. If you spin or crash by yourself we won't throw it. -Yellow flags will be on, when a yellow is thrown maintain position, gradually slowing and maintaining position behind the car in front. -The lead car will pick up the pace car (150km/h), the game will adjust positions if necessary. -The pits will be closed for the first lap under caution (yellow). -You must maintain a minimum speed under yellow or the game will move you to the back of the line. The game gives a warning first. This usually occurs when exiting the pits and building speed. -Pit Entry is from the front straight after turn 4 BUT when making your pit entry you MUST NOT slowdown until you have entered the straight on the LEFT of the track. (or in other words DO NOT slow in or before turn 4). This is to avoid interfering with following cars. Then you can brake and reduce to pitlane speed, use your limiter button. -Pit Speed 100km/h, There is a yellow line about 50m after that pit wall starts, that line is where the 100km/h starts. -A car departing their pitbox must always give way to cars entering their own pitbox, look before exiting. This is to avoid collisions. -Pit exit is onto the back straight after turn 2 using the exit road, you must then keep left until up to speed and can safely merge with traffic. Make sure you do practice pit stops before the race! -Last minute lunges down the inside just before entering a corner are not permitted, these cars are traveling at over 370KPH with the draft and sharp and darting movements will usually end in disaster. -When a passing car has placed it's nose under another car (bearing in mind No.1) the car being passed MUST make room for that car and not squeeze them down into the corner, also the passing car MUST not push the other car into the outside wall. -Drafting speed will increase dramatically when following another car, this allows numerous passing opportunities. I would highly recommend that everyone turns Auto Clutch on. These cars have no onboard starters so if you stall while out on track you will be out of the race. Will it be fixed or open setup? If my LetsPlay races are done by 9.00 i might join. Open setups. I've tried finding setups online, but all the advice I see is that the default setup is actually very good for Indy and only wings and camber need changing. Pretty sure we ran fixed setup last year? Yes it was. I would recommend it being Fixed setup. Saves me the headache of having to play with settings I do not comprehend at all in context of oval racing! Unlike road where most of the time a good driver with a average setup will still beat a average driver with a good setup. Oval racing the setup is 90% of the performance. So fixed will bring the pack closer together. In rF2 you can't adjust the weight jacker in car at all, though I think the ARBs still work with fixed setup. Nah you can't in this mod, that's a bit stink. ARB's work a treat, can get your drift on. So before I spend time making a setup are we changing to default or are we leaving it open? Yes, sorry. Since the consensus seems to be leaning towards fixed setups we will run them. Me and Murphy were on Monday night to test out some setups, actually someone else on the server sent his setup, which was quite nice to drive and which we'll probably use with adjusted downforce. Thanks for organizing this event, it certainly was very entertaining and educational, especially for someone not having raced ovals since the original Indianapolis 500 game from 1989. Following a shunt with the wall mid race (my own fault for making space after getting blue flag and thus entering turn 3 too shallow! ), my pace was severely limited - I think my 5th gear was toast so I was just limited to 4th only. Took me a while to figure that one out. In 5th, the car would not do anything above 320, only getting up to 330 by drafting. It wasn't until lap 80 or so that i figured out that by keeping it in 4th, I could push 345+. So my apologies for being a driving chicane. Gutted my game wasn't playing ball on the night with constant disconnects. It was doing the same when I tried a Tuesday night during the last BMW league too. May have to do a reinstall I think as it's only RF2 that having issues. Have you looked at your anti-virus software, if you are running any? I am using BitDefender and with rF2 I have to disable it while playing online otherwise I get terrible stuttering and lag issues, as BitDefender attempts to filter/scan all the TCP/IP traffic. I only have that problem with rF2 and it was driving me absolutely nuts until I figured out it was BitDefender that was causing this! Not saying that this is your problem as well but just something to think about. Cheers everyone who showed up. That was quite fun, good battle all race long with Kelvinator. Thanks Riven and inspire for hosting.